The Joy of Painting with Bob Ross. Photo courtesy The Guardian. The study break is a broad concept. Sometimes, it means a snack and a power nap. Other times, it’s a walk or five minutes in silence. Often, however, what’s needed to revive the brain and spirit is some good ol’ fashioned mindless television. In that vein, here is a compilation of shows that are short, sweet and don’t involve much active brainpower. Even better, they’re all available to stream, so you can watch in your preferred study space, whether that be Irwin or Monon Coffee Co. Consider this one your fix of rom-com drama with a fraction of the time commitment. “Love Island” is four seasons of pure reality TV bliss; everyone residing in the beautiful Spanish villa, where the show takes place, is looking for love, or at least someone to partner up with. Without a partner, contestants are out of the running for the 50,000 pound winners’ prize, but for the most part, the motivation seems to genuinely lie in finding Mr. or Ms. Right. Everyone that participates is surprisingly supportive of the other competitors — the girls cheer one another on in making a move or moving on, as do the guys — and you’ll find yourself rooting for nearly every single contestant in turn. Also, because the show is a British import, there is an abundance of fantastic accents, which are just an extra perk on top of the non-stop quotable lines delivered by them. In the words of the islanders, crack on! 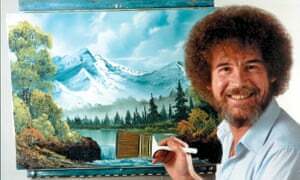 If your ideal study break is something so mellow it’s nearly a nap in itself, Bob Ross is your man. In his incredibly talented hands, watching an oil painting tutorial becomes not only incredibly soothing, but also an exercise in self-care. Mr. Rogers comes to mind watching Ross, with his “happy little trees” and constant reminders that your best is good enough. Each episode is a bite-sized breath of fresh air with a bit of a therapy session thrown into the mix, making it a perfect program for combating burnout or general impostor syndrome. Also, a good number of episodes include baby animals that Ross has a habit of saving and or raising, and that is never a detriment. I’m hardly breaking new ground in recommending “Gilmore Girls,” but if you haven’t jumped onto the now-gigantic bandwagon yet, consider this your sign to take the plunge. The backbone of the program is its characters, and it shows. Each character, even down to the most peripheral shopkeeper or classmate, is packed with personality, to the point that the script becomes an index of quotable lines. The central protagonists, mother-daughter duo Lorelai and Rory Gilmore, are an equal font of quotes — “I need coffee in an I.V.” is a college mantra rivaled only by “Nothing excites me before 11:00” — but their loveable relatability is only part of why the show makes such a good study break. “Gilmore Girls” is chicken soup for the student soul, in a way: it acknowledges the payoff of hard work and ambition, but it’s also warm, homey and filled with wholesome, authentic love. It’s also easy to follow even after months of break time between episodes, which means that no matter how often or rarely you hit play, Stars Hollow welcomes you with open arms. Word of advice: the first few seasons are the best. Laughter is the best medicine, and one of the best forms of stress relief. “Whose Line Is It Anyway” is, therefore, somewhat of a cure-all. The premise of a totally improvised sketch comedy show, loosely based in improv games, allows for a spectacularly talented cast to showcase their many skills. Combined with a generous helping of audience participation and a host with wit to rival the performers, the construction of the show results in unfailingly high entertainment value in every episode. It’s accessible, short-form and so easy to keep up with that it holds viewers’ attention even after four hours of organic chemistry problem sets. With both an American and English version available on multiple platforms, supply of a good laugh is unlikely to ever run dry. Remember Andy Samberg? The guy from SNL who did all those songs like “I’m On a Boat” and “Throw It on the Ground?” Well, he made a show, and it is nothing short of gold. A sitcom about a bumbling New York police detective and his wildly different, but equally entertaining, precinct co-workers should not be as funny as “Brooklyn 99” makes it, yet every episode is a masterpiece of smart, well-written comedy. You’ll recognize similar character archetypes from shows like “30 Rock” and “Parks and Recreation” — brooding Rosa is April Ludgate’s double, and optimistic protagonist, Jake Peralta, is reminiscent of an equally golden-retriever-esque Andy Dwyer — but the framing, storyline and overall tone of the show differs enough to keep it feeling original. The program requires little to no keeping up from episode to episode, but its overarching plot points give it strong binge-watch value as well, making it perfect for study breaks of any length. Whether you’re spending a half-hour or whole afternoon away from your textbooks, “Brooklyn 99” has you covered.